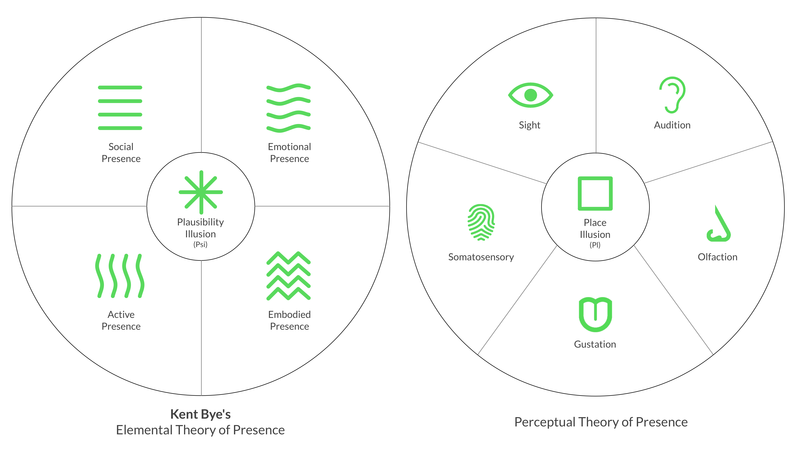 The ‘Elemental Theory of Presence’ is a useful model created by Kent Bye for describing the qualitative elements of a virtual reality experience. 1. Mel Slater. Place Illusion and Plausibility Can Lead to Realistic Behaviour in Immersive Virtual Environments Pg 5. 1. Slater, M. “Place Illusion and Plausibility Can Lead to Realistic Behaviour in Immersive Virtual Environments”Philos Trans R Soc Lond B Biol Sci. 2009 Dec 12; 364(1535): 3549–3557 Pg 10. Through the use of kinetic locomotion mechanics (in the Perambulation category), the experiencer’s physical movements are mirrored within the virtual world and helps to contribute to a greater sense of immersion, with the body being directly engaged – a key contributor to creating a state of embodied presence. The term room-scale is often used to differentiate between other types of virtual reality experiences e.g. a self-contained environment of a VR room or seated or standing VR, in which the user remains stationary. 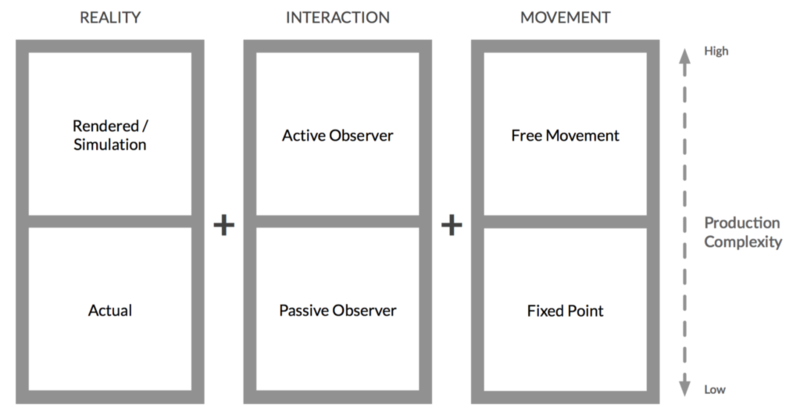 This is most commonly used to refer to movement within the virtual environment e.g. how an avatar navigates the virtual world, but can also refer to movement outside of the virtual environment e.g. how the experiencer navigates the real-world while in a virtual experience. The most common VR peripherals are gloves or controllers e.g. the Oculus Touch that look to mirror the experiencer’s innate movements and help to facilitate better active presence. Getting your head around the Metaverse and alternate realities isn’t an easy challenge so here are some simple infographics to help simplify the wonderful world or virtual reality. Virtual Reality experiences can be mapped along 3 primary scales: Reality, Interaction, and Movement. (As defined by human interface design and innovation company Punchcut). 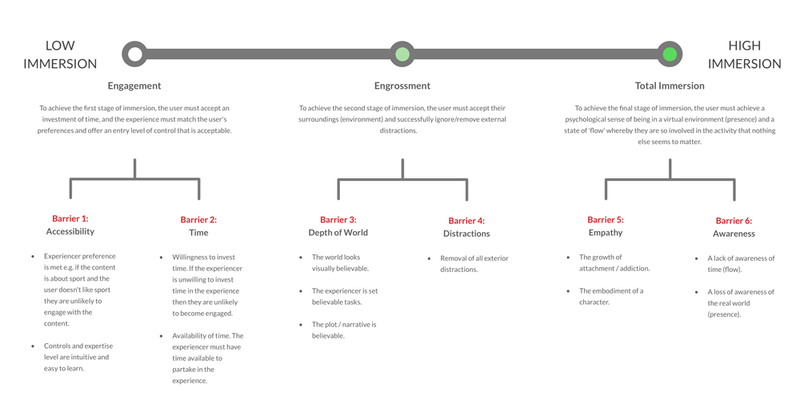 In their paper ‘A Grounded Investigation of Game Immersion’ Emily Brown and Paul Cairns define three phases of immersion and six barriers of entry. In recent years there have been a number of attempts to describe how the state of presence is created in virtual reality. ‘Agency‘ is the capacity of an entity (a person or other entity) to act in an artificial environment. It is a key contributor to enabling a state of presence in the experiencer. The phrase was coined by Story Studio and the name is a reference to actor Patrick Swayze who played the protagonist in the 1990’s film Ghost. In the film, Swayze’s character dies and returns as a ghost to help his wife solve the mystery of his death. The effect observed by Story Studio, looks to describe the struggle of affecting a virtual environment and the people who occupy it when no observable feedback from the world is being received. Another way of thinking of this illusion is as the automatic and rapid response from the experiencer to the important question: Is this really happening? If the response is ‘no’ then the illusion is broken. a generalisation of the ‘drama manager’ concept put forward by Joe Bates in Virtual reality, art, and entertainment. Originally published in Presence: The Journal of Tele-operators and Virtual Environments, Pg. 133–138, 1992. 1. Mark O. Riedl and Vadim Bulitko. Interactive Narrative: An Intelligent Systems Approach. AI Magazine Pg 3.